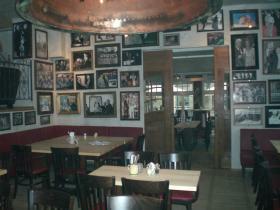 As Cologne bar-style meets with pictures of the cultural history of Bonn politics our guests are welcome to discuss all kind of topics – with history and politics offered by the surroundings. 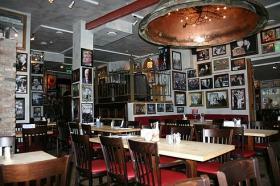 All the while the guest can sample dishes from the Rhine area with an international flair. EX Chancellor fillet "Schröder Art" and our flame cake are served on the wooden board, rustic & crispy! The permanent representation became the ex-representation! 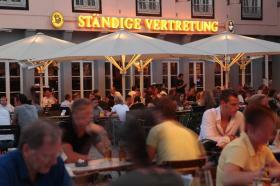 The restaurant directly at the fish market is the ambassador of the Kölsch way of life! Directly on the Rhine, in the shadow of Groß St. Martin, Cologne, "Immis" or Cologne fans will experience "dat Hätz vun Kölle" in a unique, politically influenced ambience. In the cozy rooms and the magnificent beer garden with a view of the Rhine, you can immerse yourself in the cosmopolitan Cologne lifestyle and the cozy Cologne lifestyle! Gaffel Kölsch, Gaffels SonnenHopfen and Gaffels Fassbrause are in the taproom and the kitchen offers Rhenish specialties with Mediterranean influences. A table reservation or the booking of a menu/ offer is in the "Ex-Vertretung" via GlobalGuest always for free you as a guest!